Used for differential overcurrent protection of synchronous or asynchronous generators or motors. This relay is designed to detect internal winding faults in electrical machines. It has an adjustable bias to prevent spurious trips during through-faults. 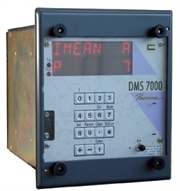 The DMS7001 incorporates a "watchdog" contact linked to a self-diagnostic system to alert users in the event of loss of auxiliary supply or microprocessor failure. It can be used with stabilising resistors to improve stability.